(Newser) – One look at Paul Gaylord's hands shows why the plague is referred to as "Black Death." The 59-year-old contracted the plague after trying to take a mouse from the jaws of a choking cat, which then bit him. 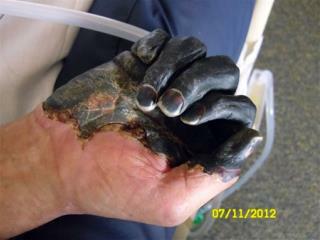 Now the Oregon welder's once-strong hands have been withered by the cell-killing infection and darkened to the color of charcoal. Doctors are waiting to see if they can save a portion of his fingers, but the outlook is grim for the man who needs them for his livelihood. The new catchphrase of 21st century USA--"We thought that was an ancient, ancient disease." That's a lesson for everyone out there, if a cat is choking let it choke (only dogs are worth saving). It seems to me we didn't have all these flesh eating bacteria/plague problems before "president" Obama came to power.